Innocence and seduction… all this in a tiny apple? Apples. Symbol of innocence and temptation; sensual love and wholesomeness. Biting into an apple can keep the doctor away or signal something different all together. The literature teacher Tina Blue once wrote that the apple has become a symbol of deadly seduction and of innocence betrayed. This is very much the case of Snow White who – by accepting the apple (just like Eve did in Paradise) – leaves her youthful innocence behind and move into another stage of existence. 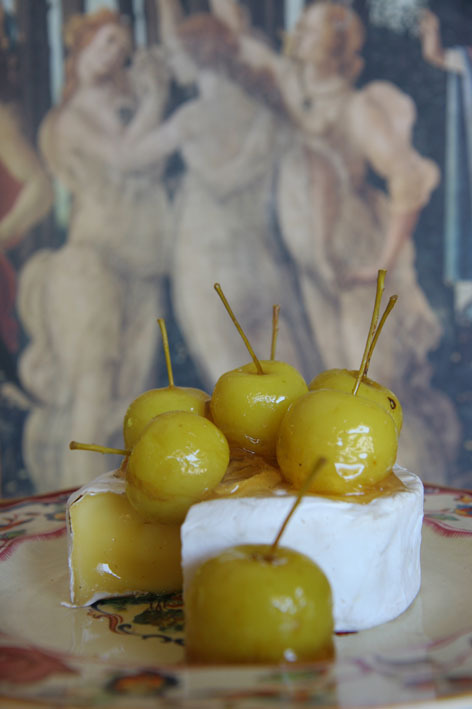 It’s with these two sides to the same apple in mind that I turned toffee apple, a sweet symbol of childhood, into a playmate for a deliciously ripened Cambrieni (itself a hybrid of two cheeses – camembert and brie). Apples were popular gifts with mythical gods; representing the cycle of life, of death and of rebirth. Heavy stuff, so let’s rather look at lighter stuff: apples in the kitchen. There’s the wholesomeness of apples in a fruit bowl on the kitchen table; warm apple pies with cream, homemade apple sauce as the ideal playmate for crisp pork belly. Apples are true multi-taskers when it comes to feeding the kids, the fresh staple of the brown bag lunch, the quick snack, the go-to fruit to enjoy with a slice of cheese. As the poster child for kiddies parties, covered in a tooth-challenging candy coat of red or fairy tale green, the toffee apple brings back memories of playgrounds, school fetes, church bazaars and fairgrounds. As the cycle of life continues rosy apple cheeks and puppy fat are replaced with teenage blush, dreams of Prince Charming in a new model BMW (preferably his own). This change from child to teen to adult goes through a heated phase. The same for the toffee apple. I dip the apple into a furnace of molten sugar candy that bubbled and gurgled at 150°C a few seconds ago. Holding onto the stems for dear life, careful not to burn my fingers, the tiny apples are transformed into edible glass baubles. The metamorphosis is instant, permanent and totally seductive. Now they wait, like Snow White in her sarcophagus of glass, for a suitor to ravish them. I choose a ripe party-sized Cambrieni as a stage for these tiny apples, now all grown up in their shiny, see-through coats. 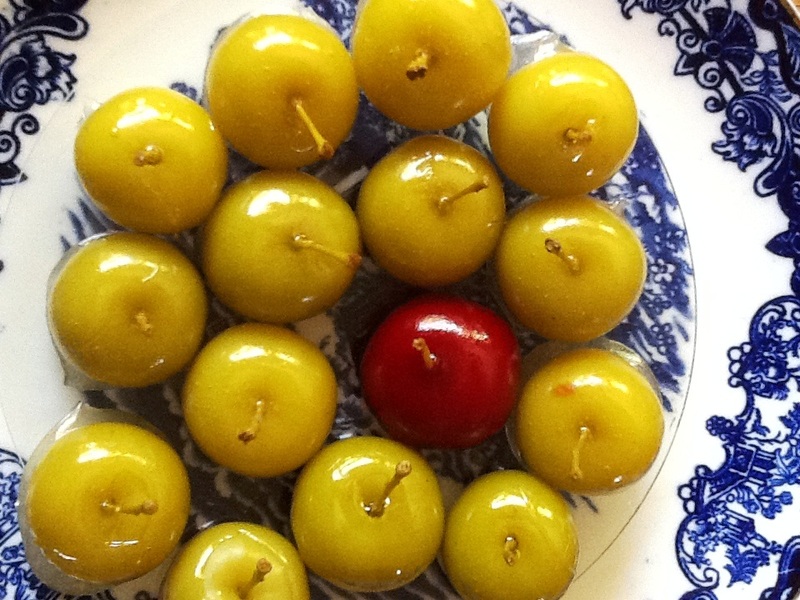 I place one red-clad toffee apple among them, a tongue-in-cheek gesture of innocence lost. This recipe has special significance for me. Toffee apples on camembert is the first dish in the opening chapter of my debut cookbook Huiskok Glanskok which I did with my friend Chef Francois Ferreira. 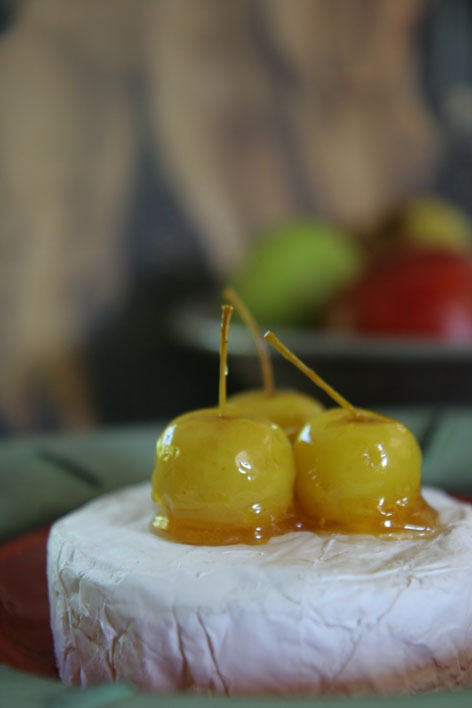 An idea inspired by a cover of Taste, this delicious combination of creamy camembert and sweet apple is my favourite cheese course and dessert in one. I use the large Cambrieni which easily serves 12 people. For a smaller dinner party 2 or 3 regular sized camemberts are fine. The tiny toffee apples work equally well as an accompaniment on a cheese board to Cheddar, matured Gouda or the delicious gorgonzola-style Simonzola. The base recipe for making the toffee was given to me by my friend Herman Lensing of Sarie. Candy and caramel can be daunting to the novice, but using a sugar (candy) thermometer makes this an easy-as-apple-pie recipe. If you don’t have a thermometer, you just need to watch the clock and use some low-tech. See below for tips how to test if the syrup is ready. This mixture is enough to coat 14 large toffee apples. 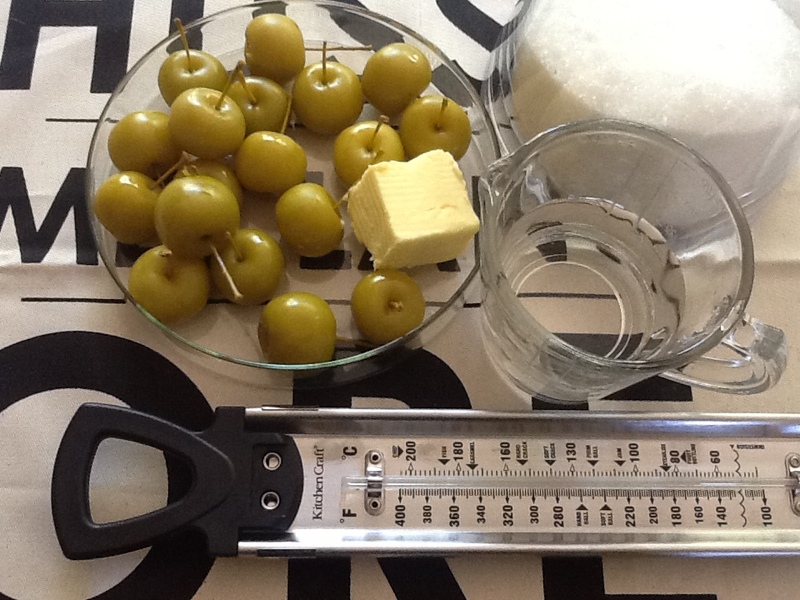 It is best not to halve the recipe, as it will not be as easy to dip the apples if the level is too low. Use the leftover to coat regular apples and dish them out to the neighbours’ kids. Getting started. Use a candy thermometer to make it as easy as apple pie! Line a baking tray or tea tray with baking paper and spray well with Spray and Cook (otherwise your apples’ bottoms WILL get stuck onto the paper). Place the sugar, glucose and water in a medium saucepan. 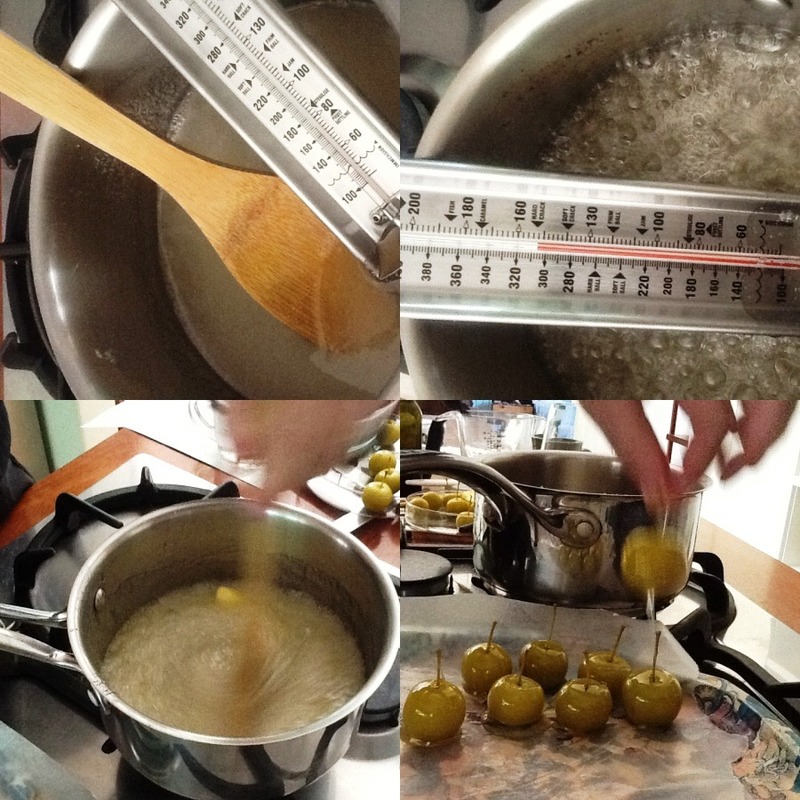 If using a candy thermometer put it into the saucepan now. Stir over low heat till the sugar has dissolved. This takes about 4 minutes. Now turn up the heat and rapidly boil the syrup until it reaches 150C (hard crackle point*). This takes around 8 minutes. Add butter and stir with a wooden spoon till melted. Be careful as it foams up. Note: if you want to make coloured toffee apples adda few drops of food colouring now. Dip each apple carefully into the very hot syrup. Place on the prepared baking paper and cool. To serve: place on Cambrieni or on small camembert rounds. Cheeky red toffee apple sneaked in. Ready to be placed on camembert, or place these on the cheese board with a selection of blues, cheddar or gouda. Testing for hard crackle phase: After 8 minutes, place a small drop in ice water. If it forms a hard glasslike ball, your syrup is ready. If you want to use this recipe to make the standard large toffee apples, simply stir in 10 mℓ red or green food colouring (less for more subtle colour). I add 5 mℓ food colouring to the remaining clear toffee mixture to make a few red toffee apples to place among the au naturals. When making standard toffee apples, insert a wooden skewer into each apple. When dipping use this as a handle. The new Simonsberg website is a great destination for cheese lovers. Go to http://www.simonsbergcheeselovers.co.za and join the club. As pr consultant to Simonsberg I get to try their products all the time. The Cambrieni is unique to Simonsberg and was a first for South Africa. It’s the perfect party piece for home entertainers and hobby cooks like you and I.
Ek kan geen groter kompliment gekry het as dat jy die resep gemaak het nie. Baie dankie, ook vir die inloer by my blog en dat jy na ons op RSG luister. Laat weet wat die gaste gedink het van die appel-kalante. Beautiful food…. I have your recipe book and it remains one of my favorites on my shelf. Definitely worth the buy. Love the story and I love that cheeky red apple!! the little red apple is making quite a statement! Quite seductive. Love the cheeky red apple making its appearance. The red apples can actually be quite beautiful using only a few drops of coloring to give it blush rather than make them scream red.